Stitched on 9 ct Linen Aida Canvas. This design is 5.3 X 6.4 and uses: 24 Karats, Weeks #5, Fancy Fur, Fuzzy Stuff, Fyrewerks, Arctic Rays, Silk n' Cream & Santa's Beard. 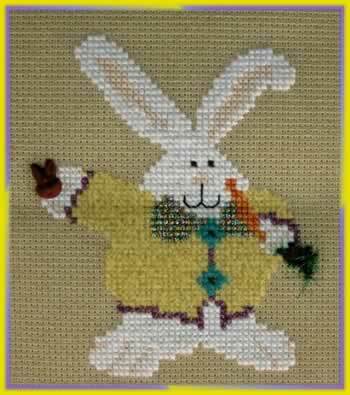 Kit Includes fabric, fibers and chocolate bunny button. Separate chart pack includes chart and button. Extra buttons are available.